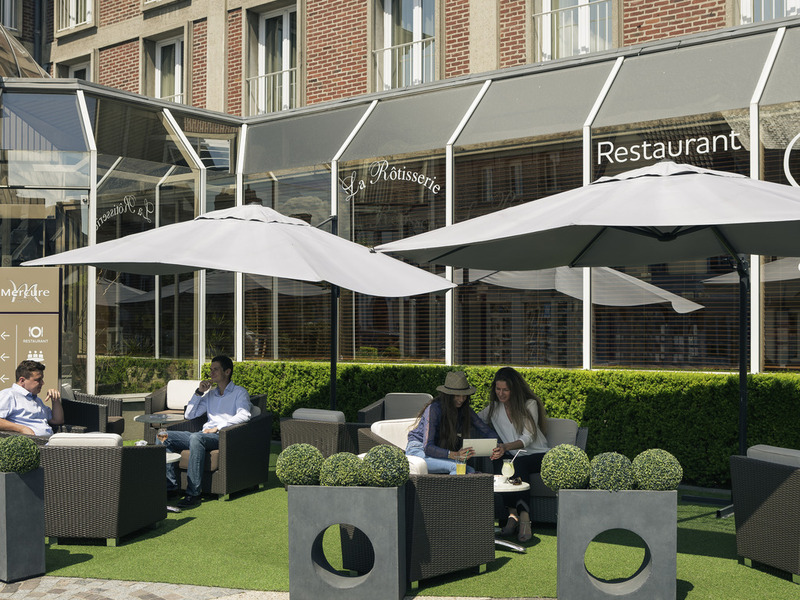 In the heart of Abbeville, 12.4 miles (20 km) from the sea and close to the train station, this Mercure hotel is ideally located at the gateway to the Bay of the Somme. A prime location for your family escapes or business seminars. You will appreciate the comfort of its air-conditioned rooms and the charm of the surrounding area. The Mercure Abbeville Centre hotel and restaurant boasts contemporary decor and customized facilities for your leisure or business stays. Located at the gateway to the Baie de Somme, this Mercure hotel is an ideal base from which to explore both the town and surrounding areas. Local attractions include the Marquenterre ornithological park and the chateau at Rambures. Choose from the various room categories to suit your needs: a Standard Room with a double bed or separate beds, or a Superior Room for families. We also have two suites with a whirlpool bath or spa bath. Must-try recipes, original dishes and regional specialties are the ingredients for our cuisine! Our large choice of suggestions changes weekly, while the menu and specials change with the seasons. Try our seasonal salads or other classic dishes while watching your favorite sports! Discover our Mercure fine wines served by the glass. Staff helpful even when error was made on bill. Meal excellent. Room as expected but please change design of headboard we bang our heads every visit! Good staff and restaurant. The bed was awful. We’ve stayed several times here and generally the experience has been good. Usually the beds have been firm and comfortable but this time the bed was soft, lumpy and unsupportive. We didn’t sleep well at all and therefore are unlikely to stay here again. We were met by Beverley at reception. She welcomed us warmly having met us before at the hotel. Very good service overall. Always look forward to staying at the hotel. As always staying at the Accor Hotels, are comfortable and the service is good. the cost of the breakfast for the two of us was excessive bearing in mind it was only a simple buffet. no alternatives in town. will not stay in a mercure again unless we can find alternative breakfast facilities in town. Abbeville pretty dead. Happily met by an exuberant front desk member of staff after a very long drive! No problem with our room change and hotel staff that dealt with us were as good as ever. Dinner was excellent and our room very clean. Hotel was very quick and easy to find from the motorway. Plenty of free car parking nearby. Rooms very clean and sufficient for our needs. Good food in the restaurant, with friendly waiters. Food portions are massive!!!! Because of channel tunnel issues we were arriving later than planned. Beverley kindly contacted us and took an order for food over the phone whylist we were driving so that we could eat at the restaurant when we arrived. We got there at 21:40 and were told the kitchen was closed and we could not eat there. I understood that we would be ok until 10pm. We had a very good selection of charcuterie etc in the bar but were charged room service which I thought unfair as it was not our fault the kitchen closed early . The barman Cyril was very nice. Beverley apologised for the restaurant closing early. Our suite was good as usual. Plenty of towels but getting very threadbare. Breakfast was ok but I missedJean Paul and hope he has a happy retirement On Sunday Angelique at reception apologised for the restaurant closing early on our first night and said this should not have happened. We have been visiting your hotel for many years. In all that time we have never been upgraded or had any specials offered. This is not a complaint as such but our loyalty has never been respected. . We had been driving for five hours and were looking forward to a hot meal and relaxing. We paid a lot of money for the suite and I felt the service was not 4 star. The staff are very polite, friendly and welcoming. Our room was more than we expected and the food in the dining room was delicious. The location of the hotel was perfect, walking distance to everything, would definitely stay here again without hesitation. We paid the price of a quality room and were given a very limited room. Having stayed at this hotel a few times we were saddened by our treatment on this occasion. restaurant staff very good ,menu limited considered the room to be over priced for a Friday night. The room was very clean and spacious. The reception staff were mainly friendly, although not all. The english channels that were supposed to be available were all in french apart from a USA news channel.